Every king needs a queen, and in Celtic mythology the beech tree is a symbol of the goddess; the partner to the stately oak and queen and mother of the woods. Similarly to oak groves, beech groves were also thought to be important to ancient British nature religions, such as Druidry, and have been found near sacred sites such as Avebury. The ancient wisdom associated with beech trees is rooted in the practice of using thin slices of beech to write upon and make books. The Anglo-Saxon word for beech was ‘bok’, the root word of the modern English ‘book’. Henwen, the great white sow of Welsh mythology, ate beech nuts and in doing so possessed the great wisdom that beech trees hold. Beech nuts have historically served the more pragmatic purpose of staving off starvation as the colder months creep in, a practice that brought communities together as they foraged for the nuts enclosed in the small, prickly four-lobed cases. 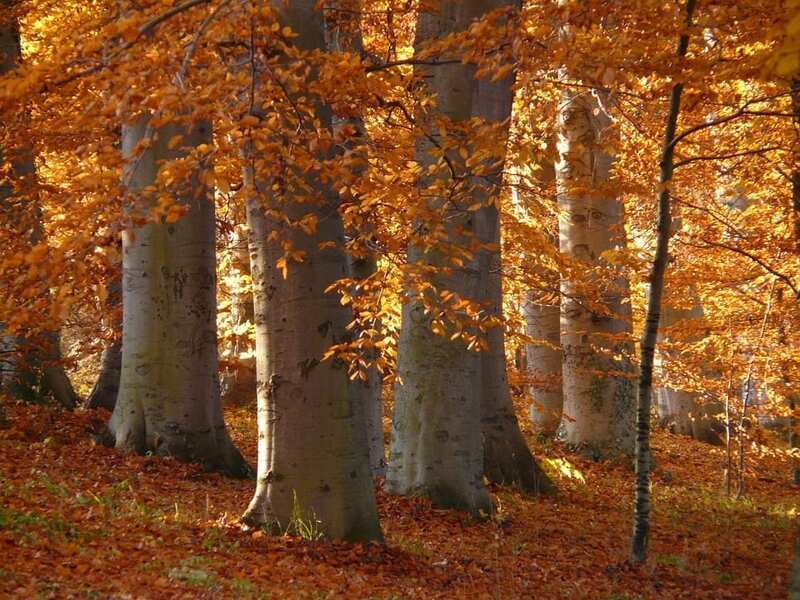 Beeches favour well-drained soil and the cool, dense shade of beech groves and their long-lasting leaf litter means that they can create an unhospitable environment to other species. However, beech woodland often plays host to Britain’s much-loved bluebell carpets in early spring, which appear before the beech canopy has closed off the light to the forest floor. Chalky beech sites sometimes have rare orchids as well as box coralroot and bitter-cress and pollarded beech trees host many lichens. Beech foliage is eaten by a number of caterpillars and moths, and the seeds and nuts are eaten by rodents and birds. Beech trees can live for hundreds of years and this longevity ensures that species requiring deadwood habitats can thrive in beech woodland, such as wood-boring insects and birds that nest in tree-holes, such as woodpeckers. Beech has many uses as timber, and is used for furniture and cooking utensils. It burns well, with a strong, calm flame, and is traditionally used to smoke herring. It is commonly seen as part of hedgerows, where it usually coppiced and maintained in order to prevent it reaching too queenly a stature. In the past it has been used for medicinal purposes when poultices of beech leaves were brewed to help swelling. Copper beeches, the exotic ornamental cousins of the European beech, derive from natural mutations. Similar in appearance, they sport deep purply-copper leaves making them a resplendent member of any woodland or garden. Whilst beech is a common sight in Britain, they are prone to drought and frost and storm damage, so may be at risk from the effects of climate change. Intelligent forest stewardship and widespread care and respect for our trees and woodlands will ensure that this woodland queen reigns well into the future.